The unique swiss venue ‘Bad Bonn’ and their annual Kilbi festival is turning 25! 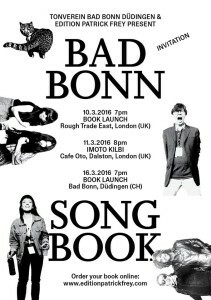 For their birthday, the swiss Editor Patrick Frey Verlag will release a Bad Bonn Song Book. The book will be launched at Rough Trade East and the party will continue at Café Oto with a very special KILBI Festival edition “IMOTO”. See the London program below ! 20:30-21:00 | Strotter Inst. >> tremendous sound objects out of turntables ! 21:15-21:45 | Julian Sartorius >> drum perversion ! 22:00-22:30 | Bruno Spoerri >> a legend! 22:45-23:15 | Camilla Sparksss >> born at -27 C°! 23:15-00:30 | Dj Doug Shipton & Andy Votel >> the dream team !